Abar Construction, led by developer Bill Barber will redevelop 960 Broadway in Albany’s warehouse district, revitalizing a property formerly home to the Rodgers Liquor Co., which has been left vacant for two decades. The 4-story abandoned warehouse will be converted into 24 market-rate apartments featuring ground floor restaurant space accessible from Broadway. This $6 million mixed-use residential reuse project will buoy the warehouse district’s ongoing transformation as other proposed mixed-use retail and residential projects in the district are taking shape or just beginning the development process. On Thursday, the City of Albany Industrial Development Agency Board approved an application to provide financial assistance to 960 Broadway, LLC., in the form of New York State sales and mortgage recording tax exemptions. Including construction, the project is estimated to create more than 50 jobs. 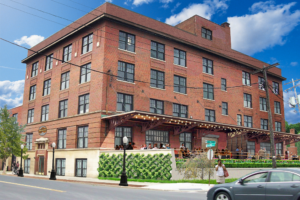 When completed, the existing 4-story, 53,000 square foot brick warehouse will have been renovated to include 24 market-rate rental apartments on its upper three floors and approximately 3,000 square feet of ground floor restaurant space with an entrance on Broadway. The existing 2-story addition on the south side of the building will be renovated into 2,000 square feet of additional commercial space. Barber is poised to tackle additional projects in the warehouse district, announced in April the conversion of the Nipper building (991 Broadway) to apartments would be just phase one of a four-phase, $70 million development project. The plan includes more than 150 additional apartments in a set of newly constructed buildings with retail space and multiple levels of indoor parking. As part of the $15 million phase one, Nipper would sit atop 65-75 residential units, the first floor would include more than 7,000 square feet of retail and office space with approximately 180 parking spaces. Adjacent to downtown Albany, the warehouse district was highlighted in Capitalize Albany’s Impact Downtown Albany strategic plan as a critical complement to the momentum driving growth in the downtown core. 960 Broadway was targeted as one of a number of priority projects in this strategic redevelopment plan for the district. The warehouse district is thriving with a rush of new interest from developers around the region. Its access to the Hudson riverfront, availability of character-rich vacant warehouse spaces, and eclectic mix of vibrant businesses make it attractive for investment. More information is available online at www.albanyida.com.